Welcome to Grand Theft Auto in EdgeGamers. To learn more about the larger fraction of EdgeGamers, check out the About Us page. Grand Theft Auto was launched as a supported game in order to expand the opportunities provided to members and gamers that hang around EGO as well to provide a punk free FiveM server, one of EdgeGamer’s key qualities. The basic idea of FiveM is to introduce a modded multiplayer experience for those who play Grand Theft Auto V, the newest game in the GTA series. EGO has decided to take the challenge of opening a roleplay server where players can live a normal life, whether it be collecting a paycheck, buying a car, robbing banks, or even saving lives as a cop, firefighter, or paramedic. This article will provide the information you need to understand how our server works. The EGO FiveM server provides a civilian experience where a trainer (or mod menu) is not required. This means all you have to do is install FiveM, join our server, and start playing! When you originally join our server, you will be given a menu to select the look for your player, given $500, and set out to experience the world. Also, on entrance, you will be given an option to enter a first and last name, date of birth, gender, and height. Make sure to follow the formats that are in the fields or else it may corrupt your user. If you ever want to customize your look on the server, you can visit any of the clothing stores on the map. Walk into them and visit the circle in the store. You will have a menu to open and it is self-explanatory from there. Once you complete your character, press enter and follow the prompts given on the screen. You may also use the /skin command to edit your player or press delete to change/edit your player model! There are many methods of getting around San Andreas. You could walk, bike, ride or drive in order to get to where you need to go. In order to get a bike, visit the car dealership (Simeon’s Dealership). In there you will find a bicycle option to purchase yourself a brand new bike. If you have the money, you could also buy a vehicle (will be covered more later in the guide). Can’t afford anything? Call for a taxi using your phone (F1). Note that someone must be in the taxi driver job in order for you to get a response. You can also call for a ride in chat as some people do these as side jobs, such as an Uber. 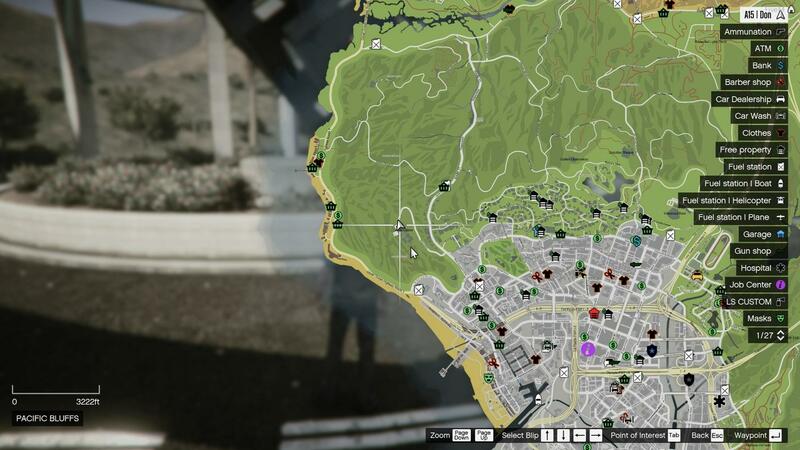 If you wish to do more illegal jobs, you can either do some drug trafficking (points are hidden on the map) or rob stores (pistol icons on the map). When you rob a store, the police will be alerted. Any money received from doing illegal activities will turn into dirty money which you have to take to another hidden location to clean. When cleaning money, you will lose some in the process. (Ask around in character for the locations of drugs and dirty money cleaning, you will not be provided this information out of character). All other jobs (Cop, Firefighter, and Medic) are whitelisted and require that you submit an application to those departments. All players also have access to an account through Maze Bank. Just visit an ATM or bank (either a blue dollar sign or a green circle with a dollar sign inside on the map) to deposit/withdrawal money to and from your bank account. The bank has a UI to help you understand the process better. Once you have collected enough money, you can visit the vehicle shop at Simeon’s car dealership in downtown LS. Vehicles vary in price so it may be wise to visit the store before hand to get an understanding of how much money you will need. Once you have purchased your car, it is will become registered to you. This means that your name will come back whenever the plate is run by a police officer. If your vehicle is not registered, you may be taken to jail or cited for no registration. Compared to our old system, all vehicles are automatically insured and are recoverable by their owners. If you lose your car or time out and your car is gone and is marked “Out” in the garage, you can go to the impound icon on the map and recover your car for a fee. If your vehicle is impounded by the police (meaning a tow truck driver tows it), you can recover your vehicle for a cheaper price from them in most instances. Once you have your car, you can visit the Los Santos Customs marked on the map to deck out your car. There are a variety of options that cost different amounts. You CAN preview things prior to you actually purchasing them (so you can go through colors, window tints, etc. without actually selecting them). All modifications, including those done by others to your vehicle, will be saved to your car’s configuration the next time you take it out. Once you purchase your vehicle, you can store it in one of the many Garages (blue garages on the map up found in Legion Square and up in Paleto Bay). We HIGHLY recommend you do this prior to leaving the server that way your vehicle is safely stored. Once you store your vehicles, you can also pull them back out of the garage. It is important to note that if you do not put the car back in the garage, it will not return into the garage until the server is restarted. There are two tools provided to players when it comes to your vehicles. They are fuel and vehicle controls. First, all vehicles have a fuel meter that can be found in the lower left-hand corner to the right the minimap (displayed as a percentage). It is important you do not let that get all the way down or your vehicle will start stuttering and will shut off. In order to refuel, simply go to any of the gas can symbols on the map and pull up next to the pump and follow the instructions and menu in the upper left hand corner. To buy weapons simply walk up to the shop (usually inside) and follow promptly once you are in the circle. Dirty money is the money collected when you do illegal things on the server. This money must be cleaned in order to be made into legitimate money. How do I get dirty money? What can I do with dirty money? You can either clean dirty money at a hidden location on the map or you can go to the black market ammunation and buy weapons you can’t buy at a regular ammunation. 1. The time, weather, traffic density, and ped density are all synced throughout the server. Individual players can not change their time on their own end. Last Modified March 30, 2017.